Irish Research company GMR Data just published their biennial report that outlines this key market, detailing which areas are set to grow and why. Their research shows that the US has the largest market for dermatology and is also forecast to be the leading market through 2028; GMR Data forecasts $12.3 billion in 2018 growing to $22.6 billion in 2028.The US is a prime target for brand drug manufacturers due to strong patent laws and high per capita health spending. US government data shows that the US has the highest total healthcare spending per capita globally, with $9,403 across 2014. 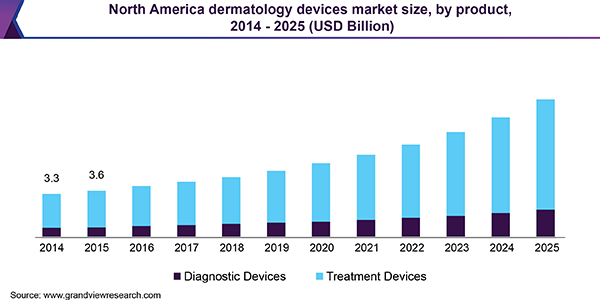 The global dermatology devices market size was valued at over USD 9.6 billion in 2017 and is expected to showcase lucrative growth over the forecast period, registering a CAGR of 13.5%. Increasing prevalence of skin cancer and other skin diseases has significantly contributed to high demand for various dermatological diagnostic and treatment procedures in recent times, thereby spurring product demand. Television, social media, and advertising have had a tremendous impact on consumers’ paying increased attention to physical appearances and esthetics. This has also raised interest in a variety of cosmetic and esthetic surgeries and procedures. This, supported by surge in consumer disposable income and introduction of technologically advanced solutions, has had a major impact on market demand. It is the joint subspecialty of dermatology and pathology focusing on the cutaneous diseases at microscopic and molecular level. It is mainly associated with the analysis of the skin diseases at basic level. Dermatopathology mainly involves the histology of the disease and results in a specific diagnostic interpretation. It is the specialized pathology of skin. The physician who is specialized in diagnosing disorders of the skin under the microscope is referred to as the Dermatopathologists. The cases of dermatopathology include melanoma, and other skin disorders, immunologic, infectious and pediatric diseases. Some misdiagnosis of certain skin disorders can prove to be fatal, it is imperative to receive the most accurate and timely diagnosis. CANADA - Canadian Dermatology Nurses Western Region Chapter | Canadian Dermatology and Skin Science Nurses | Canadian Medical Protective Association | Canadian Melanoma Foundation | Canadian Skin Patient Alliance | Canadian Dermatology Nurses Western Region Chapter | Canadian Dermatology and Skin Science Nurses | Canadian Medical Protective Association | Canadian Melanoma Foundation | Canadian Skin Patient Alliance. USA - American Academy of Dermatology | American Board of Dermatology | American Dermatological Association | American Osteopathic college of Dermatology | American Society for Dermatologic Surgery | American Society forLaser Medicine and Surgery | American Society for Mohs Surgery | American Society for Photobiology | American Society of Dermatology | American Society of Dermatopathology | Dermatology Nurses Association | Medical Dermatology Society. CANADA - Canadian Dermatology Nurses Western Region Chapter | Canadian Dermatology and Skin Science Nurses | Canadian Medical Protective Association | Canadian Melanoma Foundation | Canadian Skin Patient Alliance. USA - National Association of Physicians for the Environment | National Institute of Arthritus and Musculoskeletal and Skin Diseases | The skin Cancer Foundation | Pigment cell Research Interest Group | Society for Investigative Dermatology | Society for Pediatric Dermatology | Society for Melanoma Research | Society of Dermatology Physician Assistant | The History of Dermatology Society | The Photomedicine Society | US Environmental Protection Agency on Ozone Depletion | Wound Healing Society. Cosmetic Dermatology majorly focuses on the improvement, enhancement and appearance of skin, hair and nails aesthetically, artistically and cosmetically. It is rarely considered as a medical necessity, it can still resolve medical dermatological concerns. Treatments that are related to Advanced Dermatology (ADCS) range from deep cleansing, refreshing, rejuvenating, and restoring skin texture and tone, to reducing skin imperfections. This session will cover all the aspects of the cosmetology and dermatology. CANADA - Alliance for Human Dermatology | Association des dermatologists du Quebec | Health Canada | Canadian Association of wound careCanadian | Dermatology AssociationCanadia | Dermatology Foundation. This is the branch of medicine which deals with the diseases and disorders of skin, nails and hair. This specialty of science deals with medical and surgical aspects. A dermatologist is the one who treats diseases, in the widest sense, and some cosmetic problems of the skin, scalp, hair, and nails. 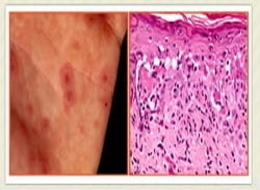 It involves study, research, and diagnosis of normal and disorders, diseases, cancers, cosmetic and ageing conditions of the skin, fat, hair, nails and oral and genital membranes, and the management of these by different investigations and therapies, including but not limited to dermato-histopathology, topical and systemic medications, dermatologic surgery and dermatologic cosmetic surgery, immunotherapy, phototherapy, laser therapy, radiotherapy and photodynamic therapy. Among all the conventional diagnostic methods there are some dermatologic disorders examples are vitiligo, pityriasis versicolor, erythrasma, porphyrias, cytodiagnosis of Tzanck in dermatologic practice eg, herpetic infections, molluscum contagiosum, leishmaniasis, pemphigus vulgaris, basal cell carcinoma, erythroplasia of Queyrat, Hailey-Hailey disease and microscopic are examined for fungal and bacterial skin infections and also for mite infestation with the use of potassium hydroxide, simple saline, and Gram stain. In modern molecular biotechnology, it encompasses gene-specific polymerase chain reaction and its variants have a substantial affect in selected cases of viral especially herpes simplex virus, bacterial, fungal, and protozoan Leishmania skin infections. USA - American Academy of Dermatology | American Board of Dermatology | American Dermatological Association | American Osteopathic college of Dermatology | American Society for Dermatologic Surgery | American Society for Laser Medicine and Surgery | American Society for Mohs Surgery | American Society for Photobiology | American Society of Dermatology | American Society of Dermatopathology | Dermatology Nurses Association | Medical Dermatology Society. This the study deals with the tissues that are removed from living patients during surgery to help diagnose a disease and determine a treatment plan. Even, the surgical pathologist also provides consultation services in a wide variety of organ systems and medical subspecialties. The practice of surgical pathology allows for definitive diagnosis of disease in any case where tissue is surgically removed from a patient. This is usually performed by a combination of macroscopic and histologic examination of the tissues, and sometimes also involves evaluations of molecular properties of the tissue by immunohistochemistry or other laboratory tests. This branch of science involves the process of selectively imaging antigens in cells of a tissue section by exploiting the principle of antibodies binding specifically to antigens in biological tissues. IHC roots come from "immuno", in reference to antibodies used in the procedure, and "histo," meaning tissue. 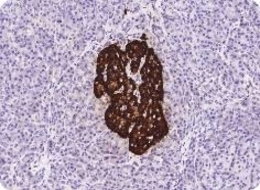 Immunohistochemical staining is the special type of staining which is widely used in the diagnosis of abnormal cells such as those found in cancerous tumors. Specific molecular markers are characteristic of particular cellular events such as proliferation or cell death it distinguish on this basis. Immunohistochemistry is also widely used in basic research to understand the distribution and localization of biomarkers and differentially expressed proteins in different parts of a biological tissue. CANADA - Alliance for Human Dermatology | Association des dermatologists du Quebec | Health Canada | Canadian Association of wound care Canadian | Dermatology AssociationCanadia | Dermatology Foundation. It is the study and application of beauty treatment on the skin under skincare. Branches of this specialty includes vast hairstyling, skin care, cosmetics, manicures/pedicures, non-permanent hair removal such as waxing and sugaring and permanent hair removal processes such as electrology and Intense Pulsed Light (IPL). Cosmetology includes an important part of the dermatopathology and that will be discussed in this session. CANADA - Alliance for Human Dermatology | Association des dermatologists du Quebec | Health Canada | Canadian Association of wound care Canadian | Dermatology Association Canadia | Dermatology Foundation. One of the most complex and fascinating spectrum of inflammatory skin diseases and the comprehension of it is inflammatory dermatopathology. While the first decade of the 21st century, numerous advances in the understanding of inflammatory disease mechanisms have occurred, especially in psoriasis and atopic dermatitis. Further continuing of this trend will assure a future in which molecular tests for biomarkers of immediate clinical relevance are used in routine patient care, not only for diagnosis but also for prognosis and management. This session will cover all the specialities of the Inflammatory Dermatopathology. Pathology is generally described as a complex and broad field that involves the study of the mechanisms behind cell and tissue injury, as well as understanding how the body responds to and repairs injury. 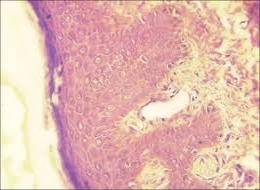 Most common examples include necrosis, neoplasia, wound healing, inflammation and how cells adapt to injury. Understanding in these areas thoroughly leads to its application in the diagnosis of disease. Generally pathology used to describe anatomical and clinical pathology. This field almost covers all areas of pathology, but less on specialist level. A person working on general pathology would be trained in the areas of laboratory analysis, like haematology and clinical chemistry. It is a nonclinical telemedicine application which is specifically related to the diagnosis of cutaneous histologic specimens. Numerous Research work is available which deals with the evaluation of diagnostic concordance of teledermatology. Teledermatology is compared diagnostic capabilities of teledermatology to our traditional face-to-face evaluations. Although the diagnostic correlation depends on various studies, most of the experts agree that Store and Forward and real-time video teleconferencing in teledermatology is as clinically effective as a face-to-face consultation. Pediatric dermatologists diagnose a wide variety of skin disorders including birthmarks skin infections, dermatitis. Pediatric Dermatologyis a subspecialty of dermatology that provides specialization in the diagnosis and treatment of skin conditions in babies, children and adolescents. The impact of abnormal skin irritations and conditions can result in feelings of emotional inadequacy in children. 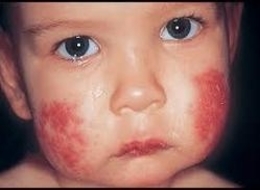 Atopic Eczema, also called Dermatitis, is a skin condition that is usually found in small children. Atopic Dermatitis can include a variety of skin conditions with symptoms including red, itchy, oozing and scaling skin. Atopic Eczemain babies also called Infantile Dermatitis is usually found on the face and scalp and causes the skin to itch and ooze. Contrary to the previous trend, the first pro-aging products are beginning to emerge. This is a trend linked to women’s liberation, in a proposal in which women get rid of the imposition of needing to look perfect all the time and the pressure of always appearing young, regardless of the stage of life they are in. As a result a new category of consumers has appeared: the silver category. Women in the silver category are over 50 years old and want to look healthy at the age they are. In this sense, cosmetics for the face correct the colour and promote hydration, but do not cover wrinkles or lead to a ‘face-lifting’ effect. In the hair segment, the idea is the same: do not mask, but soften the hair and give it back its shine. This is a trend that is aligned with the concept of a more natural appearance, sometimes even without makeup. To extract the greatest possible potential from this segment, formulators should be aware of how people in the silver category would like to look. Skin Rejuvenation can be achieved through varied modalities including: thermal, chemical, mechanical, injection, and light.Thermal rejuvenation using a radio-frequency device to induce a thermal result inside the skin. Photo rejuvenation with light-weight pulses from lasers or lamps. Mechanical rejuvenation by removal or little needling injury the outer layers to plug skin regrowth. Injections for rejuvenation with botulinum toxin A, fillers, collagen. Facial rejuvenation could be a cosmetic treatment (or series of cosmetic treatments), that aims to revive a vernal look to the face. Facial rejuvenation are often achieved through either surgical and/or non-surgical choices. Procedures will vary in invasiveness and depth of treatment. Surgical procedures will restore facial symmetry through targeted procedures and facial restructuring and skin alterations. Non-surgical procedures will target specific depths of facial structures and treat localized facial considerations like wrinkles, skin remissness, physiological state and scars. Dermatologic surgery manages the determination and treatment of restoratively important and corrective states of the skin, hair, nails, veins, secretion films and neighboring tissues by completely different surgical, constructive, corrective and non-surgical techniques. The rationale for medicine surgery is to repair furthermore as enhance the capability and restorative look of skin tissue. 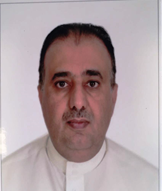 Clinical advances and instrumentation developments spearheaded by skin surgery specialists, the dominant a part of medicine surgeries are presently negligibly intrusive and need simply close or provincial physiological condition. This converts into current patient prosperity whereas at the identical time decreasing the marvelously essential "downtime" and convalescence amount. Moreover, new advancements and therefore the most up-to-date strategies are regularly raising the aftereffects of diverse founded skin surgery ways. Skin pigmentation issue influence the shade of your skin. Skin gets its shading from a colour remarked as pigment. 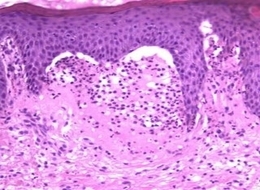 Distinctive cells among the skin manufacture pigment. At the aim once these cells finally end up plainly separated or unfortunate, it influences pigment creation. Some pigmentation issue influence simply fixes of skin. Others influence your whole body. Somebody with anomaly could haven't any shading, lighter than typical skin shading, or broken missing skin shading. Diseases, rankles, and consumes will likewise cause lighter skin. Visas should be applied as early as possible and in advance of the conference. Deramtopathology Organizers are able to provide official invitation letters to attendees of accepted posters, papers or oral presentations. Toronto is located near north-western shore of Lake Ontario and is the most populous city in Canada. It is the provincial capital of Ontario, and ethnic metropolis which is North America’s one of the most major cities. The centre of the Greater Toronto Area is the most crowded metropolitan region in Canada. As a built up worldwide city, Toronto is a universal Centre of business, back, expressions, and culture, and generally perceived as a standout amongst the most multicultural and cosmopolitan urban communities on the planet. Particularly research studies in pharmaceutical and health care domain is gaining significant growth. Toronto is arranged on an expansive inclining level crossed by a broad system of streams, profound gorges, and urban timberland. It grapples the Golden Horseshoe, a thickly populated area encompassing the western end of Lake Ontario that is home to 8.7 million individuals, or around 26% of the whole populace of Canada. Toronto is Canada’s largest health care centre which has more than 50 hospitals. Toronto also has a hospital for sick children who have great reputation internationally in clinical care and research. . Eminent leaders of Toronto have worked successfully to protect the city's heritages and its residents' quality of life from the effects of unrestrained development, even as Toronto has continued to grow into a major financial, cultural and health care centre. Toronto is a conspicuous community for music, theatre, film generation, and TV creation, and is home to the base camp of Canada's significant national communicating systems and media outlets.